The bombings in Boston last week remind us that mid April is a time of remembrance: of the Battle of Lexington, of the children of Waco, of the Oklahoma City horror... but it is also a time of remembrance of the Uprising of the Warsaw Ghetto, which erupted on April 19, 1943. And in remembering that battle we remember the courage of those who would not go quietly. This is a rerun from October 2009. It didn't get much attention when I first ran it. Perhaps its time has come. Sometime in my elementary school years, I read a children's book entitled Escape from Warsaw, by Ian Serraillier, a rip-roaring children's book about the 1944 Uprising of the city of Warsaw against the Nazis. Many people know about the Warsaw Uprising: that was a desperate act by the Polish Home Army to liberate their nation's capital and bring home the Government-in-Exile in London before the Soviets had a chance to impose a Communist regime in their state. They were betrayed by Stalin, however, who had his armies sit on their collective duffs long enough for the Nazis to send in the SS to flatten Warsaw. And Escape from Warsaw was a resounding good read about a family who managed to reunite themselves in Switzerland after being blown to the winds by the forces of history. But when I was in seventh grade, I found a book in the Ottawa Junior High School library entitled The Uprising of the Warsaw Ghetto, by Irving Werstein, thinking it was a history book about the 1944 battle described in Escape from Warsaw. And I learned it was about a much different battle that happened a year earlier, one not so well known. And in that book I had, I believe, my first real moral awakening. Up until then World War Two, which my parents had lived through, was nothing but a kind of a big adventure that had happened thirty years earlier. You know: Patton, Hogan's Heroes, Combat, etc etc. It was in reading about the courage of the leaders of the Ghetto Uprising--of Marek Edelmann, of Mordechai Anielewicz, of Zivia Lubetkin, and those who decided, in the face of utter, overwhelming odds, to stand up to evil and to fight back against the extermination of their people--that I first learned the true meaning of human evil, and too: the true meaning of human courage. Their story bears recounting. It is as great a story as any in the Old Testament; indeed, its heroes bear remembrance in the same ranks as Moses and Aaron, Joshua and Samson. After a third of a million people were gassed at Treblinka, some fifty thousand remaining survivors in the Ghetto rose up against the German occupiers from January to May 1943. They fought under the banner of the resistance group Żydowska Organizacja Bojowa (ŻOB), the Jewish Fighters' Organization. Seventeen Germans were acknowledged killed (although it is possible that the number was higher); of the Jewish defenders, seventeen thousand killed in armed combat or through on-site execution and the rest were sent to the gas chambers. It was an honorable fight--more one-sided than Thermopylae, and against an enemy more to be feared even than the dread Xerxes. Edelman (and Zivia Lubetkin also, it should be noted) was among a small group of ghetto survivors who broke out on May 10, 1943, and escaped to the nearby woods to fight as partisans. They fought the Germans again in the Warsaw Uprising the following year. Lubetkin, and all the other Ghetto survivors, relocated to Israel after the war and formed their own kibbutz, the Ghetto Fighter's Kibbutz, or Lohamei HaGeta'ot. This is good. If Israel is to survive then Israel must be strong. And none were stronger than the Ghetto fighter survivors. Today, Lubetkin's granddaughter is the first female fighter pilot in Israel. But one man chose to remain in Poland, the last voice of the Polish Jewish community, now a tiny band of 4000 people where once they had been three million. Edelman's courage during the Uprising was exemplary. But it was his long, lonely stand for human freedom under the Communists where he truly showed his great worth. He chose a medical career, becoming a cardiologist. Later, he became a spokesman for freedom, and was active in the Solidarity labor movement that eventually pitched the Communists. The Soviets feared him so much that they interned him during their 1981 attempt to suppress the union movement. Later he served in the Polish Parliament, and he was awarded Poland's highest honor, the Order of the White Eagle, in 1998. Many of the others in our group presented here are members of the Remnant--but the Remnant itself is a metaphor for an underlying truth. But in Mr. Edelman's case, it is the most horrifying literal reality. Once the children of Israel were three million strong in Poland alone. Today they are but a scattered few hundreds in that sad nation. No better representative could have been chosen for them, though, than Marek Edelman: soldier, doctor, healer, resister of Nazis, resister of Communists, and at the end of his life, numbered among the great of his peoples, both the Poles among whom he was born and the Jews to whom he was a shining exemplar. 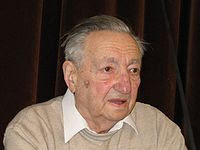 Marek Edelman died on October 8, 2009, in Poland of honorable old age.